This naturally sweetened Blueberry Pie Smoothie is vegan, gluten-free and perfect for breakfast or any time of the day. Okay, now that I’ve gotten out my song parody of the day, I feel much better. But I would like to point out that I think Smoothie Operator would be a really cool name for a smoothie shop. And the song,”Smooth Operator” could just keep playing on a loop all day. 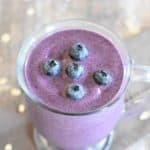 Like my Banana Almond Butter Cacao Smoothie, Apple Blueberry Lemon Smoothie and Apple Banana Smoothie with Peanut Powder, this Blueberry Pie Smoothie contains no added sugar. In fact, I typically don’t add any additional sweetener to my smoothies, but rather rely on the fruit I’m using to provide the sweetness. I’ve found that frozen bananas work well in smoothies, not only for sweetness but also for consistency. They also make a fantastic base for vegan ice cream, which I’ve been experimenting with and am hoping to share on the blog in the near future. But for now, we’ll get back to this Blueberry Pie Smoothie. This is the kind of blueberry pie that is acceptable for breakfast. A blend of bananas, blueberries, coconut milk, cinnamon and gluten-free oats, this dairy-free drink is the perfect way to start your day. It will taste like you’re indulging on a slice of pie, but without any of the guilt. Instead, you’ll be getting a glass full of vitamins and minerals, healthy fat, fiber and protein. Add 1 frozen banana, 1 cup of frozen blueberries, 1 cup of unsweetened coconut milk, 1/4 cup gluten-free oats and a heaping 1/4 teaspoon ground cinnamon to a high-powered blender. I highly recommend the Nutri Ninja, which I have been using for years, but you can use your favorite device. Blend until smooth and ingredients are well-incorporated. To make this smoothie, I used the Nutri Ninja cup rather than the pitcher, so that I can just blend and go. I recommend using the machine’s Auto IQ Ultra Blend setting when blending frozen fruits. Add all ingredients to a high-powered blender, and blend until smooth. Love the colour of that smoothie! It sounds delicious too! This will make a great breakfast for my girls. I’m always looking for new recipes to try to get them to eat a healthier breakfast and this is perfect. This smoothie look great and so delicious! Love blueberry – so good. Definitely going to be trying this out! I always go for smoothies for breakfast, just so quick and convenient! I love that you’ve added oats in this for added fibre!